Dr. Keith Christopher Rowley is the Leader of Opposition and Member of the House of Representatives for Diego Martin West in the Parliament of Trinidad and Tobago. A geologist by training, Dr. Rowley has been the representative for Diego Martin West since 1991. Keith Christopher Rowley was born on 24 October 1949 in Mason Hall, Tobago, and was raised by his grandparents, who were prominent Tobago farmers. Dr. Rowley is married to attorney -at- law Sharon Rowley, they have two daughters Tonya (attorney-at-law) and Sonel (post graduate student) both of whom won national scholarships. Dr. Rowley completed his secondary schooling at Bishop's High School, (BHS) Tobago and his sterling academic performance saw him capture the prestigious Sylvan Bowles Scholarship at Bishop’s High School. He then commenced his studies at the University of the West Indies, Mona, Jamaica, from where he graduated with a BSc. Geology (First Class Honours), Geography (First Class Honours); MSc in Volcanic Stratigraphy, UWI, St. Augustine. He is a Volcanologist who obtained his Doctorate in Geology, specialising in Geochemistry. He is a known nature lover, who enjoys gardening, hiking and is an avid golfer. Dr. Rowley first ran for political office in 1981, where he contested the Tobago West seat. 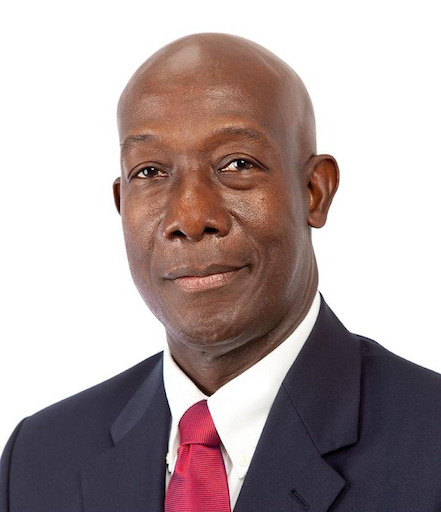 To date Keith Rowley has the distinction of being the only PNM candidate to have contested a seat in a General Election in both Tobago and Trinidad. He is the Member of the House of Representatives for Diego Martin West in the Parliament of Trinidad and Tobago, where he has represented that area since 1991 having been re-elected in 1995, 2000, 2001, 2002, 2007, 2010, and 2015. Dr. Rowley first served in Parliament as an Opposition Senator from 1987-1990 (3rd Parliament). He was later appointed Minister of Agriculture, Land and Marine Resources (4th Parliament), Minister of Planning and Development and Minister of Housing (8th Parliament) and Minister of Trade and Industry (9th Parliament) until he was fired by then Prime Minister Patrick Manning. He also served as Trinidad and Tobago’s representative Governor of the Inter-American Development Bank (IDB) and Governor of the Caribbean Development Bank (CDB). Following the People's National Movement (PNM) defeat in the Trinidad and Tobago 2010 general election, Rowley was elected the PNM’s fourth political leader in its 57-year jistory. He was subsequently appointed Opposition Leader of the Republic of Trinidad and Tobago. As Political Leader he advocated implementation of the ‘one man, one vote system’ that has strengthened democracy within the PNM. Dr. Rowley has served on several Parliamentary committees. In 2004 he chaired the Joint Select Committee of Parliament which examined and made recommendations for the live broadcasting of Parliamentary debates. On Rowley led the PNM to victory in the 7 September 2015 winning 23 of 41 seats. Rowley will be sworn in as Prime Minister on 9 September 2015. He becomes the seventh Prime Minister of Trinidad and Tobago and the second Tobago-born Prime Minister. Dr. Rowley is married to attorney -at- law Sharon Rowley, and is a father of three.